These prices reflect academic pricing. For-profit institutions should contact TopoGEN directly for a quote. DNA methylation is an epigenetic encryption process that is a central feature of gene expression and control. DNA methylation is mediated by several DNA methyltransferases (DNMT1, 3a, 3b) that target selected genes and genomic regions. The overall process is essential for development, embryogenesis and normal tissue epistasis. Mis-regulation of DNA methylation is acutely detrimental to normal tissue function and can lead to loss of growth control in cancer ands many chronic human diseases (as well as aging). While genetic mutations in growth control gene circuits are a common antecedent step in cancer, epigenetic aberrations are very common as well, such as promoter silencing of tumor suppressing genes (p53, p21 among others). Specifically, promoter gene silencing, mediated by incorrect DNA methylation action, is an underlying etiology in these cases. Moreover, genetic alterations are fixed events (unalterable) while epigenetics, although generally stable and heritable, can be reversed using drugs (or epi-therapeutics). For example, 5’-Aza-2’-deoxycytidine (and 5-Azacytidine) are DNA hypomethylating drugs that will essentially reverse these inappropriate methylation marks at silenced tumor suppressor genes and/or activate antiviral defenses. This will in effect re-establish normal tissue epistasis and block growth and spread of malignant cells. The mechanism that controls DNA methylation in somatic cells is not well understood (2) and there is a need to: 1) identify regulatory factors in methylation; 2) identify novel pathway protein (or genes) that influence methylation; 3) characterize cell circuitry that can directly or indirectly impact epigenetic revisions; and, 4) establish the role of non-coding RNA in regulating DNA methylation events. TopoGEN scientists have created a novel, cell based kit to examine epigenetic reprogramming in a Hela cell mode. 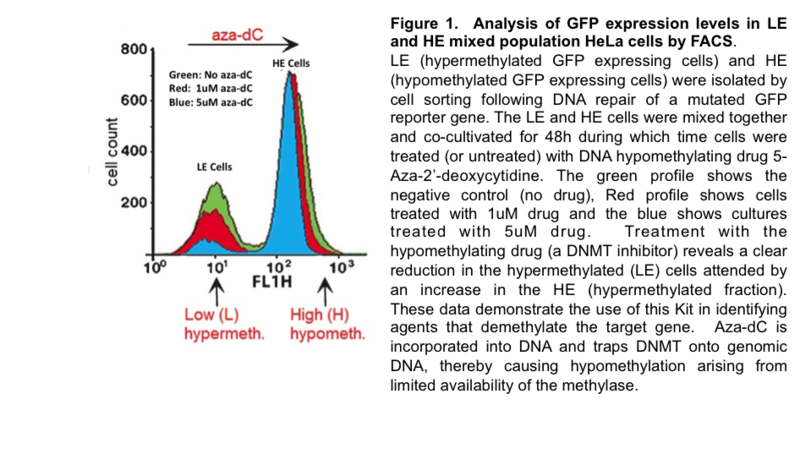 The Kit is based on the use of hyper- and hypomethylated GFP reporters that can be altered by known DNA methylation modifiers (such as Aza-C). This is illustrated in Fig. 1 using Cytofluorimetry to assess expression levels of GFP. LE HeLa Cells ready for culture in T-25 flask. HE HeLa Cells ready for culture in T-25 flask. Control Drug. 5-Aza-2’ Deoxycytidine, 10mM Stock in 100% DMSO. Neomycin (50mg/ml). Counterselective antibiotics should be used only during routine passage to ensure that the plasmid is retained. Generally, we omit these for specific experiments (for example if you are drug testing or screening).